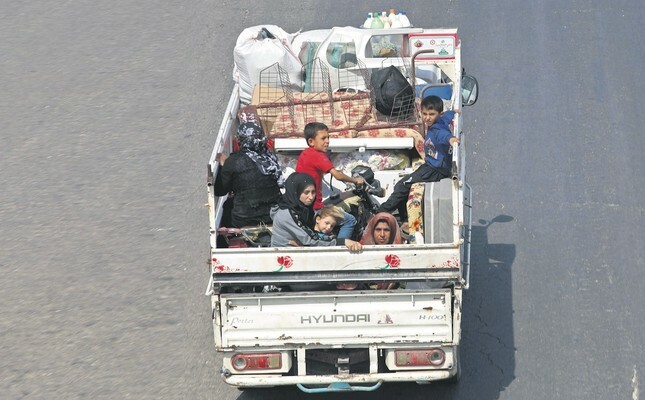 Residents of Idlib province flee toward the Syrian Turkish border, Sept. 10. The heads of local administrations in northern Syrian territories warned of a new refugee wave toward Europe if the Syrian regime and its backers launch a full-scale assault on Idlib, since they have no more room to host internally displaced people in the war-torn country. Fuad Abbas, head of the local administration in northern Aleppo's district of Marea, told Daily Sabah that if the tensions in Idlib turn into a full-scale conflict, millions will flee toward the West from the province, which will trigger a new humanitarian crisis. Russian and regime warplanes have continued to conduct airstrikes in Idlib and northern Hama this week amid ongoing negotiations to prevent a large-scale offensive. The airstrikes resulted in the deaths of scores of civilians and have caused the displacement of tens of thousands. Turkey, along with European Union countries and the United States, has been calling on the regime, Russia and Iran - the main backers of the Assad regime - to refrain from actions that would destabilize the area. "Turkey should not bear this refugee burden alone and it literally cannot. I call on the Ankara government to open the doors on its western borders in case of an offensive, so Syrians can freely move to the European countries," Abbas said. Ankara, for now, prevents refugees from going through to Europe as part of a deal signed with the EU in March 2016 to curb refugee flow. However Turkey has said that lack of European support and unmet promises may force it to reconsider the deal. Earlier in June, the U.N. said that in the case of a regime﻿ offensive, the only route out for those fleeing would be through Turkey, which already hosts more than 3 million Syrian refugees. Most of the Syrian refugees have used Turkey as a gateway to reach European countries, particularly Germany. Speaking to Daily Sabah on the issue, Jamal Osman, head of the local administration in al-Bab said that a possible regime offensive would not likely result in internal displacement, rather a refugee wave toward the West through Turkey. In 2016, Turkey launched the cross-border Operation Euphrates Shield in northern Syria to clear Daesh in the area and eliminate threats posed by the group to Turkey. Several towns were cleared in operations conducted by the Turkish military and the Ankara-backed Free Syrian Army (FSA). As part of normalization efforts in the region, local administrations have been formed by local people to bring life back to normal. "We are currently beyond our capacity in the Euphrates Shield areas in term of hosting refugees. If these people had intentions to move Turkey, they would have done it. They will head to Europe, via legal or illegal methods," Osman said. Since the beginning of September, approximately 40,000 people have already been displaced amid increased airstrikes targeting civilian areas. Only around 5,000 of them have since returned to their homes, according to U.N. figures. U.N. officials have also said that 900,000 people are expected to flee if the government launches a large-scale offensive in Idlib. Locals in liberated areas are also perturbed on the developments in Idlib. They are stressing that once again the region is in risk. "Everything was fine before regime's threat to attack Idlib. Now, people who left their homes are moving here due to fears of a new offensive. There is even a decrease in car prices, because locals who are in fear of possible offensive are selling their vehicles under their value and leaving the area," said Abdurrahman Sheikh, 28, who returned home to Azaz from Turkey four months ago. "If we lose Idlib, there is nowhere to go for these people. I hope Turkey, our only protector, will prevent the regime attack," he added. The civil war in Syria erupted in 2011 when the Assad regime harshly responded to protesters who had poured into the streets to demand more rights and freedom. The protests initially emerged following the Arab Spring demonstrations that resulted in strongmen in Egypt, Tunisia and Libya stepping down. The cruelty against the protesters triggered a rebellion in significant parts of the country, turning into a brutal civil war. So far an estimated 500,000 people have been killed in the war. So far, around 6 million people have been displaced internally and another 5 million were driven abroad as refugees since the beginning of the Syrian civil war, according to U.N. figures.